INDIANAPOLIS -- While he's no Edward Snowden, IUPUI University Library archivist Stephen Towne has blown the whistle on little-known facts about government surveillance of civilian activities -- during the Civil War. Towne and his book are the subject of a segment of the PBS podcast "The Good Stuff." "The Origins of Government Surveillance," one of several videos in the PBS "Civil War Time Capsule" group, was posted earlier this year and features an on-camera interview with Towne. Towne says "The Good Stuff" hosts got a few facts "a bit wrong." And he dismisses their comparison of him to Snowden -- his book "blew the whistle on spying in the Civil War, the Army spying on its people," a host said -- as "fanciful." But the librarian approves of the video's approach. "Their M.O. is to educate by entertaining," Towne said. "If they educate people and lead them to ask questions and think about the past, I'm fine with that. Maybe it'll sell a few books, too." Archivist Stephen Towne and student Amna Awad review campus records in Ruth Lilly Special Collections and Archives. 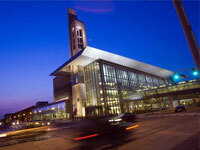 IUPUI University Library File Photo.